Redemption isn’t a word Jim Heron knows much about—his specialty is revenge, and to him, sin is all relative. But everything changes when he becomes a fallen angel and is charge with saving the souls of seven people from the seven deadly sins. And failure is not an option. Vin DiPietro long ago sold his soul to his business, and he’s good with that—until fate intervenes in the form of a tough-talking, Harley-riding, self-professed savior. But then he meets a woman who will make him question his destiny, his sanity, and his heart—and he has to work with a fallen angel to win her over and redeem his own soul. 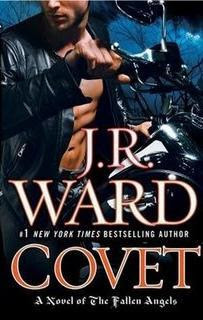 Covet is the first book in J.R. Ward's Fallen Angel's Series. I absolutly loved Ward's Black Dagger Brotherhood books, and am extremely excited that she is starting a new series featuring Angels! Plus, I'm practically drooling over that cover, he looks like such a bad boy...mmm. I'll definitely be buying this one as soon as it hits the stands! OMG I soooo want this one!! Thank the Warden for this books! Had no idea that she was coming out with a new series. Wow! Looks awesome! Will definitely put this on my wishlist! Thanks!